It is located beside the Microsoft Office Button. By default it shows three commands; Save, Undo and Redo. When you click the drop-down arrow at the right end of Quick Access Toolbar it offers more commands. The desired command out of these commands can be added to Quick Access Toolbar with a left click on it. You can also add the Office Button and Ribbon commands. 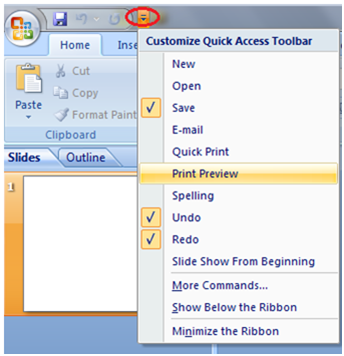 Just right click the command and select the "Add to Quick Access Toolbar" option. See the image, the command New Slide is added to Quick Access Toolbar.